Britain’s Prime Minister Theresa May hosts a meeting with leaders and representatives of Caribbean countries at 10 Downing Street on April 17, 2017 in London, England. 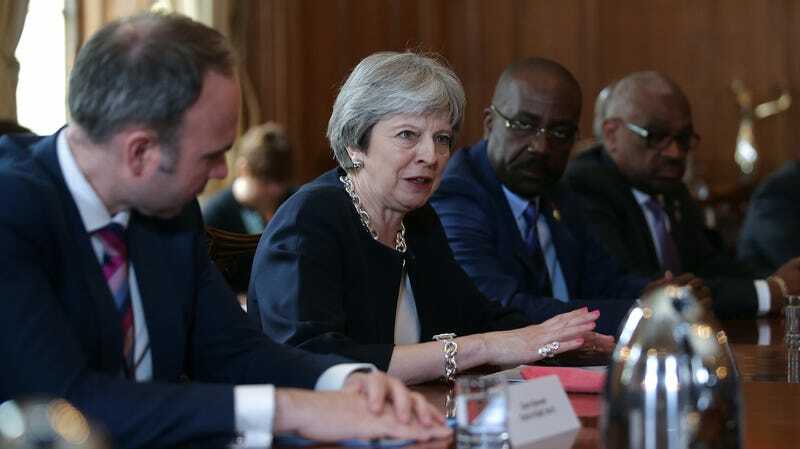 Theresa May is meeting Caribbean leaders as the Government faces severe criticism over the treatment of the ‘Windrush’ generation of British residents. Some immigrants known as the Windrush generation, who have been living in the UK for decades, are now being denied citizenship because they lack the proper documentation proving they lived in the UK before 1973. Seventy years ago, when the UK was recovering from World War II, Britain put out ads in Caribbean countries under its control, hoping to attract people to help rebuild the country. In 1948, 492 West Indians—as British subjects—boarded the vessel Empire Windrush, attracted by a promise of more stable work. They ushered in the Windrush generation—a generation of black and brown people from British Commonwealth nations that were invited to come work in the UK until 1971, only to face harassment, bullying, and racism when they arrived. According to Oxford University’s Migration Observatory, there are an estimated 500,000 people in the Windrush generation. The 1971 Immigration Act gave Commonwealth granted Windrush members indefinite permission to stay in the UK, but didn’t offer them documentation or proof of status. In recent years, Theresa May’s recent anti-environmental crackdowns, coupled with her anti-immigration agenda, have led to deportations, refusal of basic services, and firings among the Windrush generation as employers and agencies are required to seek documentation to prove residency in the the UK since 1973—something that many members don’t have, because they came to the country as children under their parents’ passports. Many residents, especially older residents, cannot prove they are in the UK legally. According to the Independent, the UK government now refusing some of them citizenship over failure to meet the “necessary good character requirement”—a justification that holds immigrants to double standards and is also being used to deny citizenship to 10-year-olds—and a lack of documentation—which, again, the government never provided these migrants. “The Windrush generation have helped build this country as they themselves have built a life here,” said Home Secretary Sajid Javid. “I am appalled by what some people have been through but am delighted that our taskforce is helping so many people to establish their right to be here and gain British citizenship.” Javid said that taskforce has granted 2,121 people citizenship, and 2,398 people have offered sufficient documentation to stay in the UK.